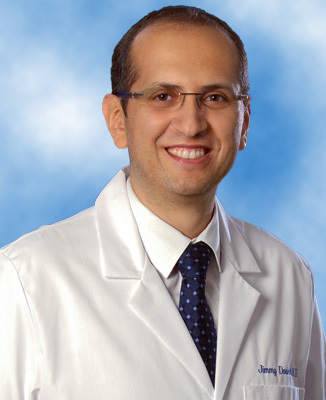 Jimmy Doumit, MD, received his medical degree from Lebanese University in Beirut, Lebanon. He completed his internal medicine residency at the University of Kansas School of Medicine, in Wichita, Kan. He has completed fellowships in sleep medicine, as well as pulmonary and critical care medicine at University of Illinois at Chicago. He is board certified in Internal Medicine and Sleep Medicine by the American Board of Internal Medicine. Dr. Doumit has written articles on Sleep Apnea in Type 2 Diabetes and Obstructive Sleep Apnea and Circulating Potassium Channel Levels. He has been involved with multiple quality improvement projects, which include increasing the awareness for usage of ideal body weight in mechanically ventilated patients or increasing the accuracy of diagnosis of asthma. Dr. Doumit’s accomplishments and awards include an Outstanding Case Report, an Abstract Competition Clinical Vignette winner, and a Young Achiever, National American College of Physician. He is also fluent in Arabic and French.